A celestial coincidence is a fact is because mathematically and physically this planned and governed only by the laws of nature. No gods, no gods, no people, no aliens are responsible or those who, because they want to make these things happen. Although we can say that you can see the future, but not because it is “written” but because it is mathematically and physically predictable because we know the laws that regulate the movement of the stars and allow us to calculate are paths with great precision (not absolute). 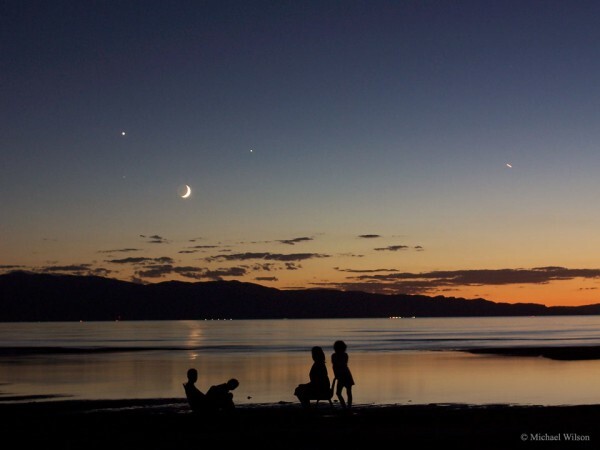 The picture you see is of 2005, of Utah, where you see the moon (easily recognizable), Venus (to the left of the moon, the brightest), Jupiter (right, with elongated), a star called Spica (Alpha Virginis for friends, in the constellation Virgo) just below Venus and an airplane passing by. Nature is not controlled by anyone but is governed by laws created in the same instant as the Big Bang. Life is a differential equation with many auxiliary equations that create and delimit the conditions that happen. Some are known, others not. Just remember that mechanics given in schools is not Newtonian mechanics but mechanical Lagrangian (Lagrange), based on the Lagrange equations that are nothing more than a variation of Newton in which the important thing itself is not the position and if the energy of the particles/things whatever. So you know, you do not study Newtonian mechanics, but Lagrangian in schools.